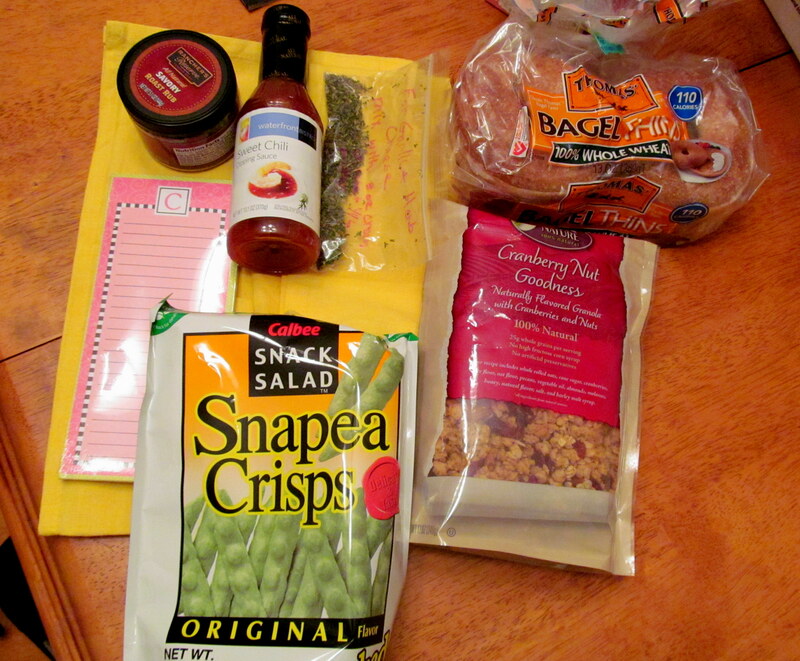 Lindsay‘s Foodie Pen Pals program continues to impress me each month. 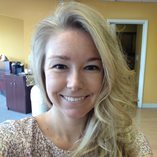 Not only is she doing a great job running the growing exchange, but this month I was matched with someone much older than me, which I thought was fabulous because I am all about meeting new people of all ages, especially since I entered the working world and started this blog. My pen-pal was Loy of From Grandma Loy’s Kitchen. She is almost 70 and really is a grandmother! So I completely trusted her taste before I even opened the above box. After all, she’s got tons of food experience! The recipes on her blog look amazing. What an amazing package! The pink notepad is my favorite color (Loy asked me what that was before she put my package together) and I can’t wait to use it at work to make lists (I’m a chronic list-maker). The yellow cloth towels that the goodies are resting on were another piece of the package that Loy picked out with a specific color in mind. She asked for the color of my kitchen wallpaper, and it’s yellow with flowers. Turns out she wanted the towels to match the kitchen – so sweet! My mom appreciated that too. 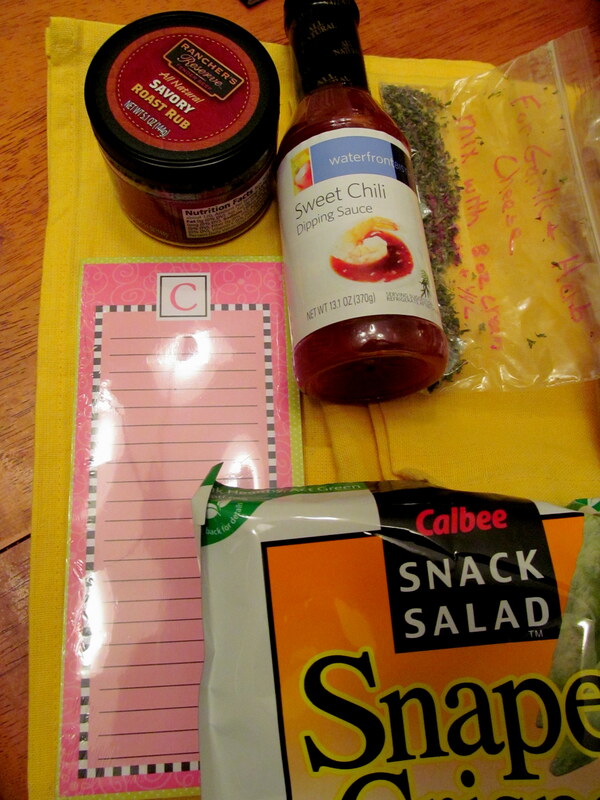 She also appreciated the sweet chili dipping sauce, savory roast rub, and garlic & herb mix. Why is that? Well, we are having an Easter party with our usual group of formerly-Florida-resident pals, and all three of these items are DEFINITELY going to be utilized in both appetizers (garlic & herb dip with crackers and veggies, along with the dipping sauce for shrimp cocktail) and dinner (the roast rub for our chicken and pork tenderloin). Can’t wait to share how it all turns out! Heather was visiting the night I received and opened my box, and she squealed with delight when she saw the salted snapea crisps. Apparently they’re awesome – I can’t wait to break into them! Side note: the company that makes them, Calbee America, also makes baked shrimp-flavored chips. Um, baffling, and yet I REALLY want to try them?! I’ve been dying to try the Thomas’ 100% Whole Wheat Bagel Thins! I usually stick to their english muffins with my daily dose of Laughing Cow, but now I can try something new, ESPECIALLY since I discovered just yesterday that Laughing Cow now makes Light Cinnamon Cream Cheese wedges – um, yes please, thanks. 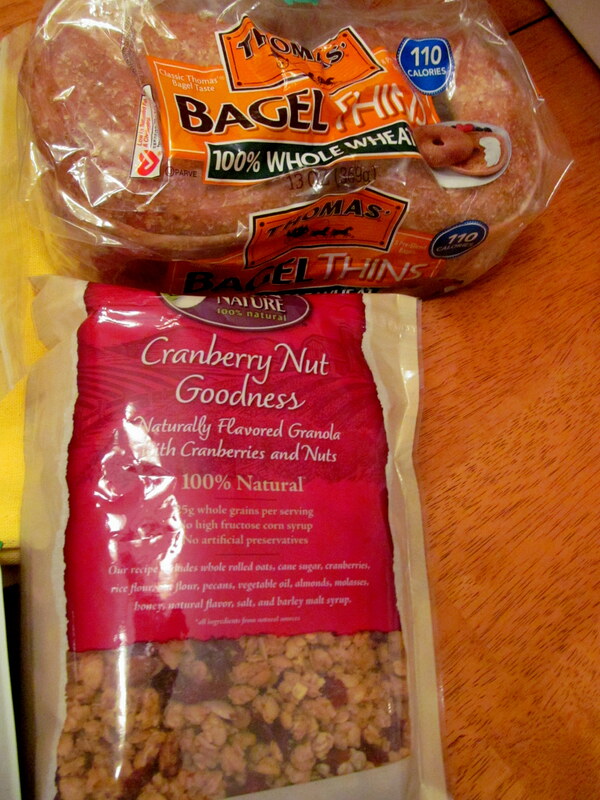 The Cranberry Nut Goodness granola is honestly not my thing – I’m just not into cranberry, or granola for that matter. However, no food goes to waste! I passed it on to a good friend who loves granola! 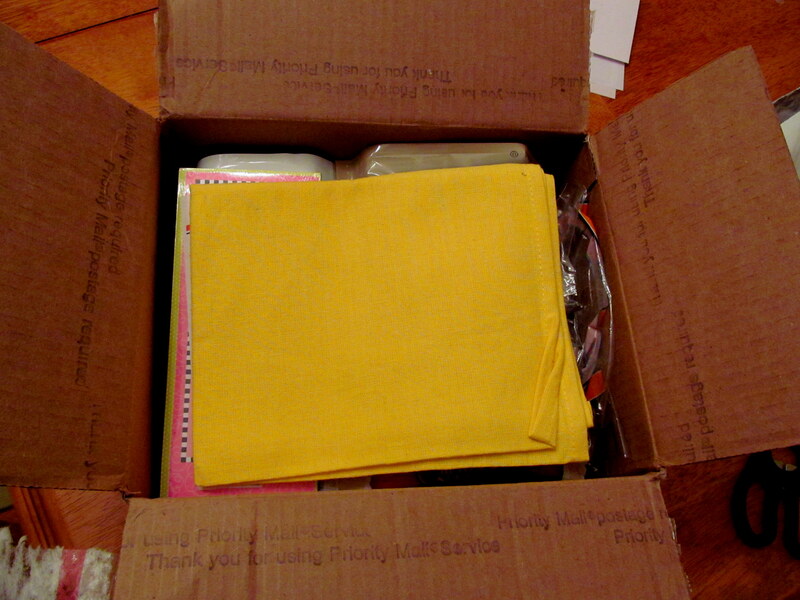 Thank you again to Loy for putting together such a great package for me, and customizing it so well! If you want to sign up for Foodie Pen Pals, check out Lindsay’s info page on The Lean Green Bean to find out more! Also check out what I got my pen pal Brittany of Go The Xtra Mile! Have you ever tried any of these products? Which would you most want to try?